The 1954 New York state election was held on November 2, 1954, to elect the Governor, the Lieutenant Governor, the State Comptroller, the Attorney General, the Chief Judge and three associate judges of the New York Court of Appeals, as well as all members of the New York State Assembly and the New York State Senate. This was the first election in which the voters were required to cast a single joint vote for governor and lieutenant governor, following the amendment to the State Constitution in 1953. Chief Judge Edmund H. Lewis would reach the constitutional age limit of 70 years at the end of the year. He was elected in 1953, and John Van Voorhis was re-appointed on January 1, 1954, to the seat vacated by Lewis, to fill the vacancy temporarily. Albert Conway and Charles S. Desmond had been elected to the Court of Appeals in 1940, thus their 14-year terms would expire at the end of the year. The Socialist Workers nominated David L. Weiss (born c. 1914), electronics worker, for governor; Dorothy Haines, of Buffalo, for lieutenant governor; Harold Robins, of New York City, for comptroller; and Catherine Gratta (born c. 1922), machine inspector, of Brooklyn, for attorney general. 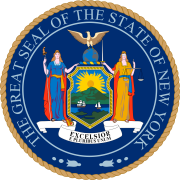 The American Labor Party nominated John T. McManus for governor; actress Karen Morley for lieutenant governor; Ralph Powe, lawyer, for Comptroller (the only African-American running for a statewide elective office this year); and George W. Fish, lawyer, of Brooklyn, for attorney general. The Socialist Labor Party filed a petition to nominate candidates as the Industrial Government Party on September 30. The ticket had only three names: Nathan Karp for governor; Stephen Emery for lieutenant governor; and John Emanuel for comptroller. The Democratic Party held its convention on September 21, 1954, in New York City. The main contest was for governor which was between former Secretary of Commerce W. Averell Harriman and Representative Franklin Delano Roosevelt Jr. Harriman had the backing of Tammany Hall and city organizations, Roosevelt agreed to drop out in exchange for his nomination for attorney general. The next week the Liberal Party of New York endorsed the entire Democratic slate. Almost the whole Democratic/Liberal ticket was elected, only Republican Jacob K. Javits managed to be elected attorney general. The incumbents Van Voorhis and Desmond were re-elected. The American Labor Party lost its automatic ballot access and disbanded shortly afterwards. Note: The vote for governor is used to define ballot access, for automatic access are necessary 50,000 votes.